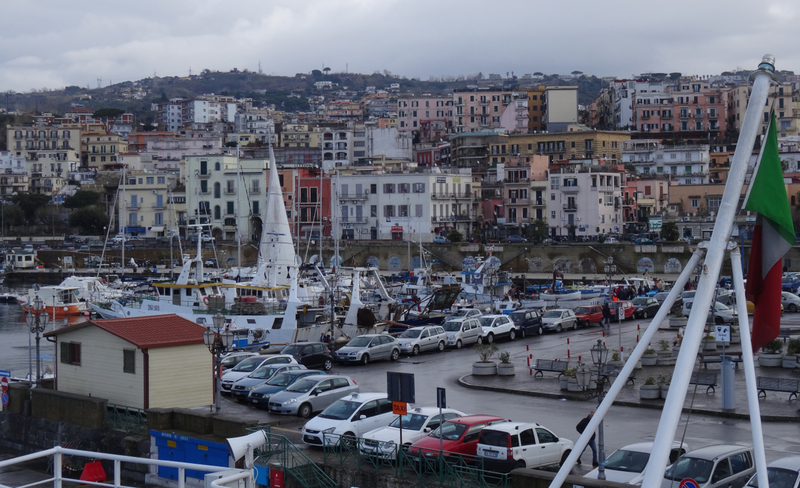 Pozzuoli, some 15km west of Naples, should be an ordinary, busy ferry port … but it’s not and never has been. Part of what makes it unique is that it can’t stop moving. 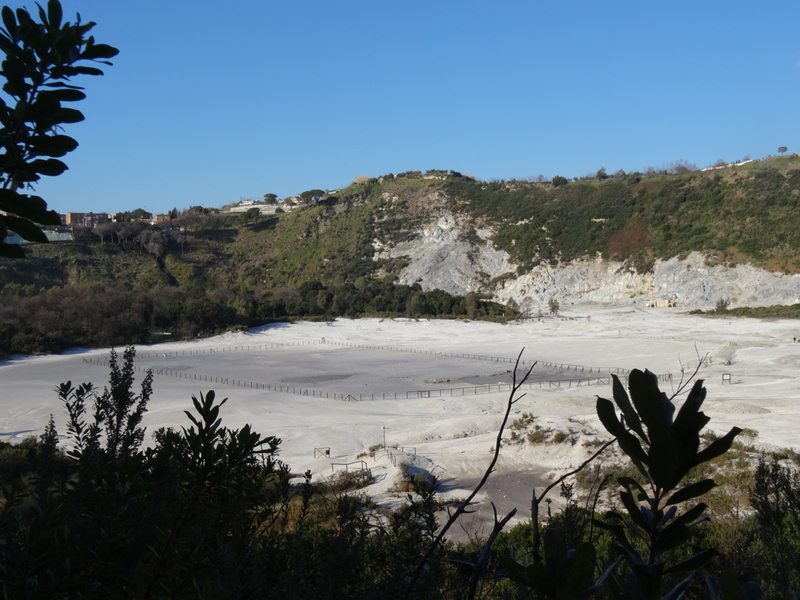 La Solfatara, a crater formed some four thousand years ago, just up the hill from Pozzuoli’s harbour, is a vivid example of what’s going on. We looked down at it first from the hills around its edge. It’s dust-white and wide, with thin layers of boiling grey mud then occasional steaming clumps of stained, yellow rocks. 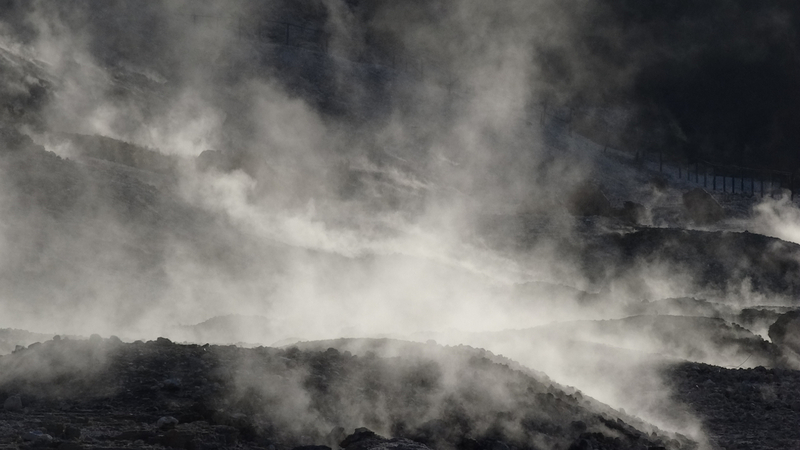 We walked on to the surface and deep into the smell of sulphur with air that steamed in bursts off the bubbling ground. It felt like science fiction, like another planet – it was an unsettling reminder of what’s not so visible down the hill where it feels normal … but isn’t quite. Most of the movement in Pozzuoli itself has been slow bradyseism – relatively gentle up and down movements of the earth’s crust – with occasional shocks. In the early 1980s these were quite violent and left parts of the area a couple of metres higher than before. This shifting makes life unpredictable for the residents, but fascinating for geologists and archaeologists. 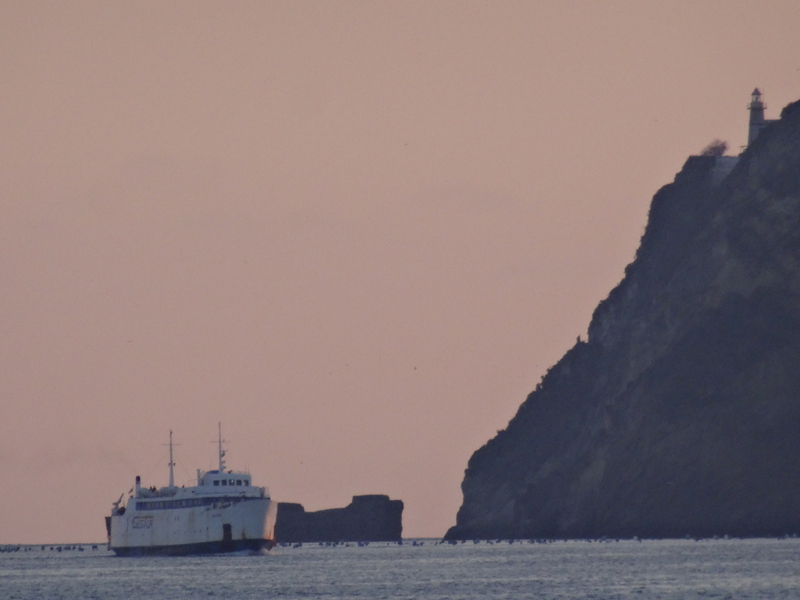 The whole area is now part of the Regional Park of Campi Flegrei and under the protection of UNESCO (United Nations Educational, Scientific and Cultural Organization). It sounds like a ring-fenced exhibit – but it’s not. It’s a town earning its living and first impressions are of a busy ferry port with queues of traffic along the seafront. 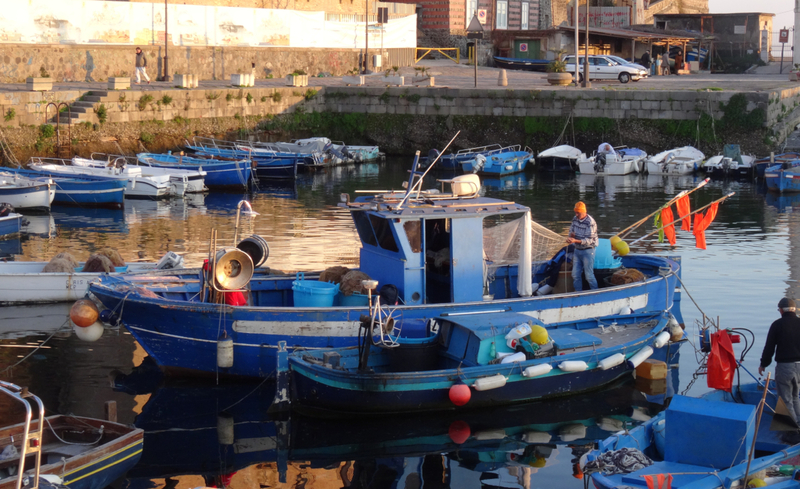 Beyond the carparks are the thick, stone walls of a small harbour, old bricks mixed with new. 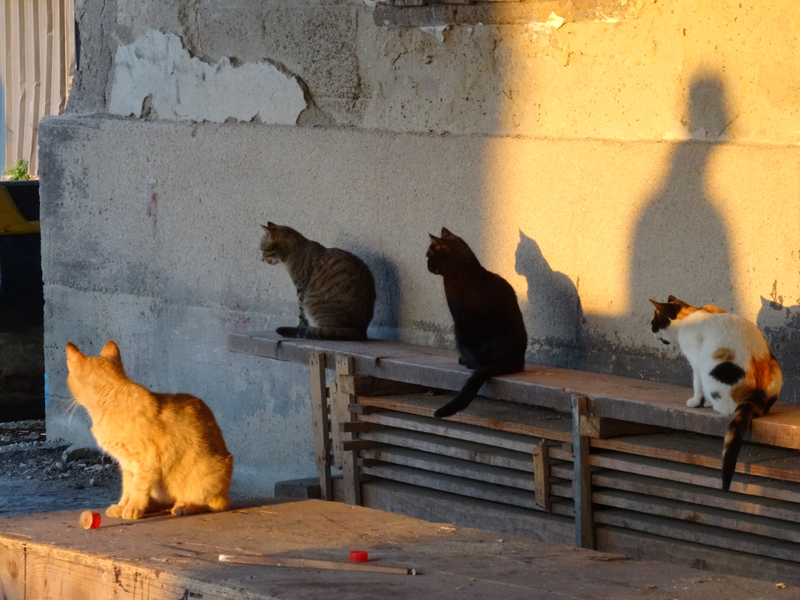 Here there is a simple church; fishing-boats; lovers on the seawall; and cats waiting for the catch to come home. In Roman times, when the town was known as Puteoli, bradyseism seems to have shaken the area down rather up, which has left much of the ancient seafront under the waves although some of it has re-emerged such as the grandly titled Temple of Serapis. This temple, now known to be an old market, is just across the road from the modern ferry port and its pillars show clearly how the waters have come and gone. 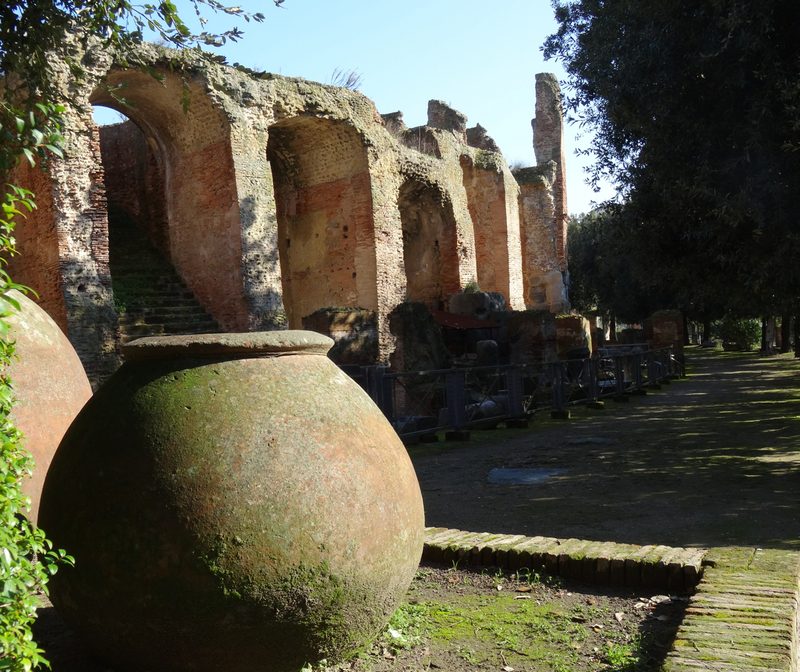 Higher up, away from the sea, there is drier, grander evidence of Puteoli’s Roman past – the Anfiteatro Flavio. This is a huge, impressively complete amphitheatre – said to be the third largest in the known Roman world with seating for over 40,000 and caverns beneath for gladiators and ‘wild beasts’. When we visited the arena was almost empty apart from the seagulls catching the sun on the grassy seats. Their tiny shapes on the top tier of layers helped get a sense of the size of the arena. Below ground there was echoing space, filled with shafts of light and toppled columns – all part of the missing; of the vanished crowds; of the waiting gladiators; of the “dust and shadows”. 3) it had pozzuolana – dark red volcanic soil – the magic dust that gave Roman concrete its strength and which went into some of its most impressive and long-lasting buildings. Sadly, as with most booms, Puteoli’s fortunes didn’t last. First competition arrived – Trajan developed the port at Ostia and Egypt’s grain sailed further north; and then, its great patron Rome, began to falter. 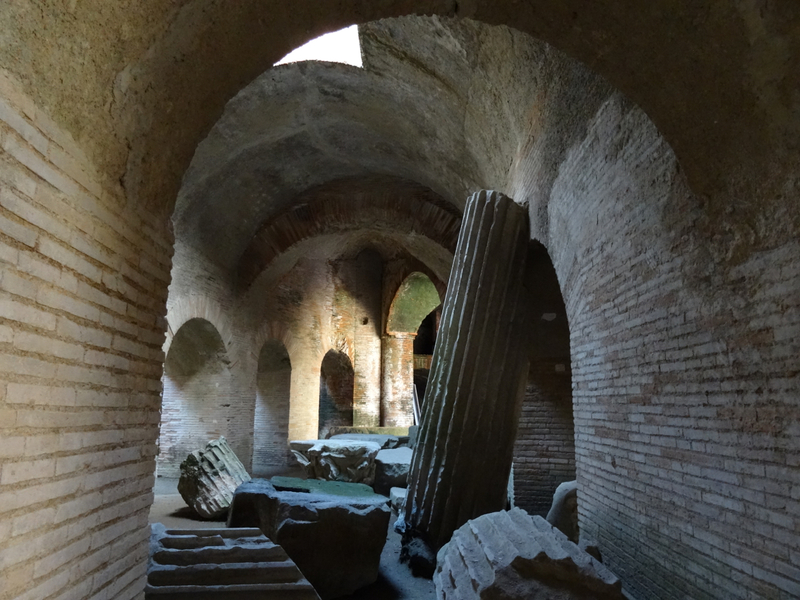 As the Roman empire slid off the map Pozzuoli had to find its own way forward. Its been doing so ever since despite its ups and downs. 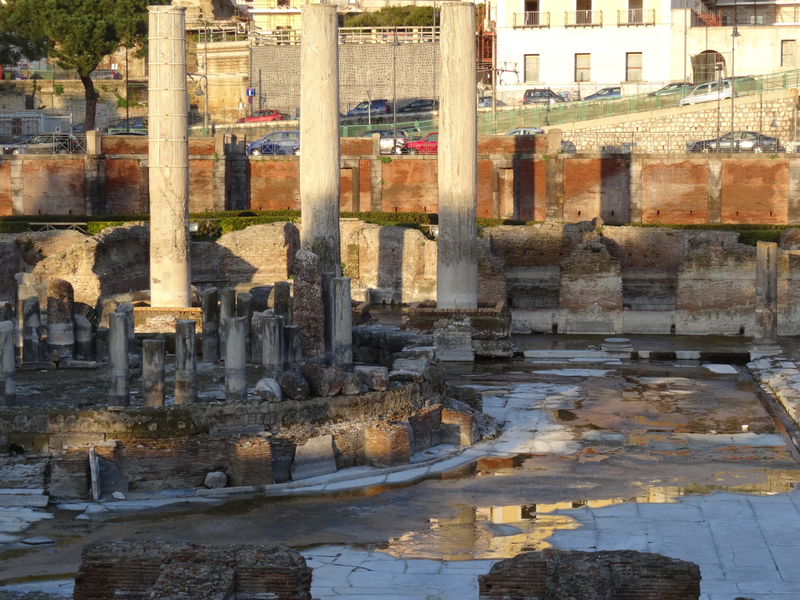 This entry was posted in Bay of Naples, Italy, Pozzuoli and tagged amphitheatre, Bay of Naples, Campi Flegrei, gladiators, Nero, Pozzuoli, Roman concrete, Rome, Temple of Serapis, volcano. Bookmark the permalink. What a fascinating read, with terrific photographs. I also learned a new word, bradyseism. 🙂 Thank you, Georgie!